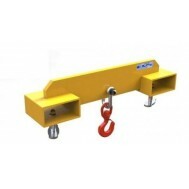 This Provides a quick & economical method of the lifting and positioning of unpalletised loads. Multiple lifting positions can be achieved by the correct positioning of the attachment along the fork blade. When height is at a premium the Low profile Jib allows the movement of long and awkward loads from accessible locations, with the potential of five different lifting centres.